Technically, this is not a book report, as I listened to the abridged form of this book on tape. No, really, on tape. I procured it sometime in the misty past and saved it for such a time as I would sit down around an old cassette deck to listen to these things. Fortunately, though, instead of waiting for that time, I bought a user vehicle with a cassette deck in it, and I got to listen to this audiobook, which I had filed with our Teaching Company Great Courses. Which is not; whereas those are taught by professors with some experience in making material interesting, this is a book read. So the language is more book language than spoken language, and it sounds like it. Olympia Dukakis reads it pretty flat. So: Why do the Greeks matter? I guess the book makes the case that Ancient Greece is the font of all Western thought, especially when blended with the Judeo-Christian tradition coming out of Israel in the early A.D. The book recounts tales from Greek mythology and turns its attention in turn from story-tellers, poets, philosophers, and statesmen with a little bit about the military history, but it’s not the focus. It’s a high level summary, with plenty of time spent on pederasty and glowing reviews of the statues of young men. This, combined with the infrequent use of casual vulgarity for no other reason than signal the author’s authenticity and twenty-first century sensibilities, led me to stop listening to the course when my children were in the car. Oh, and it does get a little left towards the end with a bit of misdichotomization between the Classical Greek and the Christian worldviews, and I didn’t have to see the date of the book’s publication to know what strutting, smirking simpleton contrasted unfavorably with Pericles and Kennedy. To be fair, Kennedy doesn’t measure up to Pericles as a stateman for the ages, either. Also, I’m not sure how you say the classical Greeks were more into “social justice” than the Christians, but I’m well-educated enough to perhaps write a counter-argument were I needing to publish or perish or convinced that anyone at all would read, much less be convinced, by my effort. 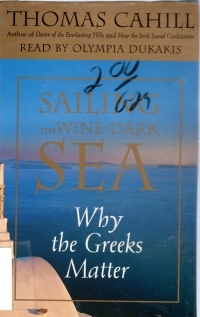 So at best, you can revisit some things you should probably already know about Greek history (although perhaps the book’s target audience, possibly those educated in the latter half of the twentieth century, wouldn’t). It’s a pretty good indicator, again, of why I should really travel a little further afield of classical history when I’m picking out things to listen to in the truck. I remember more when I start out knowing less, and that seems a better use of my time.